Geppetto slipped the final gear into place and tightened the last screw. Finished. He sat back and viewed his creation. Fifteen years and all his reputation, that’s what this little thing had cost him. But oh if it worked! Never mind the years, never mind the ridicule. If it worked, it would be worth everything and more. He grabbed a kettle of boiling water, and, gently pulling the face closer, he poured the water into its mouth to fill the internal boiler. “Drink my boy. Drink and let it be living water to you,” he whispered. He leaned forward, eyes riveted on the machine. Gears turned and flywheels spun inside. With quivering hand, he reached into his shirt and pulled out the glimmering blue aether crystal he had worn about his neck these past fifteen years. He slipped it off of its chain and put it in the waiting open socket in his little creations chest, then closed the panel and caressed the face, willing it to life. Nothing. The contraption was working fine. He could feel the fluids moving through their tubes and hear the gears grind in their purpose. But no spark opened his little Pinocchio’s eyes. 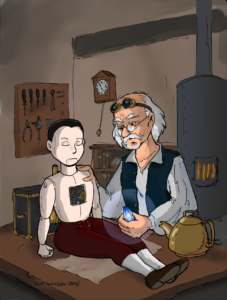 Tears filled Geppetto’s eyes as the wound in his heart tore open again and ached just as it had fifteen years before. Fifteen years earlier, a Geppetto with far less grey in his hair worked on another machine. The bulky frame stood some eight feet tall, and every angle of the monstrosity screamed of death. “It nearly is m’lord.” Geppetto forced a humble look onto his face and bowed just low enough to mollify the stuffed shirt. “By this afternoon, the device will be complete, and tomorrow it will be pressurized and ready for a full demonstration. I assure you, your money has been well spent.” He looked at the beast of a machine and repressed a grimace. “Spent on blocks.” He thought. “Flat panels and bare rivets with not a touch of elegance.” Nothing delicate like the other nobles ask for in a watch or clock. Oh well, fitting I suppose for him. A machine of untempered death, with knives for fingers and a cannon for a heart – for the man with no class or subtlety, and war on the mind. “Then stop jabbering and finish it!” Lord Dighton whirled around and marched out the door to the waiting carriage and, no doubt, waiting trollop. Once he was certain that Dighton wouldn’t find further reason to come back and henpeck at some imagined flaw, he went back to work. Geppetto tapped his hammer on the beast’s tank, marking the machine as done in his mind, filled it with water, and set the flame low to begin heating its steam reserve. He pulled out his watch and glanced at the time, his eyes lingering on the graceful movement of the hands and delicately engraved case. A few hours yet before Pinocchio would be home, but more than likely he’d be hungry as all growing boys seem to be. The day was warm. That, combined with the smells from the soup and the relief of finally being finished with Dighton’s beast, lulled him to sleep. A sudden loud clanging brought Geppetto not only out of his slumber but right out of his chair onto the floor. Geppetto forced an appropriately disgruntled look for a moment, as a father should, then chuckled a devious little chuckle and tackled the boy, tickling him until tears ran down Pinocchio’s cheeks. “Shush! I won’t hear it this night. Tonight, we feast! Now, join me in our majestic banquet room.” Geppetto pulled out Pinocchio’s chair and gestured for him to sit. “Here, seat yourself upon your throne and let us dine.” The grin on his face spread ear to ear. The two kept at their game for hours, long after the soup had vanished. Eventually, feeling the fullness of their bellies and the lateness of the hour, Geppetto declared it was bedtime. “Oh Father, I want to show you first. Follow me!” Pinocchio grabbed him by the hand and pulled him toward his shop. It took a moment for Geppetto to realize that the low flame he had set to heat the water overnight now roared like a bonfire beneath the tank. He could hear the low moan of metals stressed by too much pressure and the sharp hiss of small vents of steam coming from seams strained beyond his design. his heart dropped. Pinocchio smiled his mother’s angelic smile, raised his hammer and swung at the reservoir. The explosion ripped the metal beast to shreds, flinging shards of metal through the room. A large piece caught Geppetto in the shoulder, knocking him out the door where he crumpled to the ground, unconscious. The clock-maker awoke to the smell of smoke, the crackling of fire and the sight of frantic men dashing around. He tried to sit up but the pain in his shoulder made him fall back with a shout. A man squatted beside him and helped him sit up. “No… No!” He looked around and spotted a sheet covered form some twenty feet away. Geppetto scrambled over to the blanket, ignoring the screaming pain from his shoulder. He ripped the blanket off and stared at the mangled form of his boy, scalded and ripped by the explosion. An aether crystal, the thing that gave life to his wondrous machines, protruded from his heart. Fifteen years later Geppetto hugged the body of his mechanical boy and rocked the lifeless form as he sobbed. The same face held against his shoulder, but now made of metal instead of flesh. The same Aether Crystal embedded in his chest that Geppetto had pulled from his dead son’s chest all those years ago. A crystal that for fifteen years had been his hope. A crystal that stored its master’s instructions. Surely such a crystal could store the will of a small boy to live. Why could it have not have absorbed his son’s soul? He slammed a fist on the workbench. Why not! Yet, there was nothing. Everything was in place. All the mechanics functioned. But nothing worked. When the tears eventually slowed, the old man kissed his boy machine on the forehead, letting his tears slide into his never-son’s eyes, laid the body on his workbench, and sat back, shoulders slumped and head bowed.